Congressional Republicans have released their "tax reform" plan. Words flow from their summary sheet like seductive whispers: "More Jobs. Fairer Taxes. Bigger Paychecks." What's not to like? The economy will boom. It's for everyone. We can afford it. Listening to their rhetoric transports many Kansans into the past, to 2012, when we heard those same sweet nothings. Back then Kansas succumbed. Our tax experiment was launched. And what happened next? Income tax revenue dropped like a rock, creating a perpetual budget crisis that threatened public education, highways, and a host of other services. The promised jobs and economic shot of adrenalin never materialized, leaving Kansas' economic performance lagging neighboring states and the nation. And the poorest Kansans ended up paying more while the wealthiest Kansans got big breaks. By 2016 Kansans figured things out and changed their Legislature. Then a bipartisan supermajority of lawmakers rescinded the tax cuts with a veto override and started Kansas toward recovery. 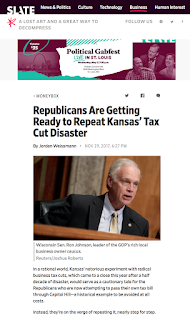 After all that, how can it be that every member of the Kansas congressional delegation-every single one-now supports a Kansas-style tax cut plan for the nation? Lynn Jenkins, your proposed plan includes a huge LLC loophole, something Kansans came to understand as deeply unfair. Actually, the proposed loophole is worse. It may be advertised as benefitting "small business," but it only applies to individuals with "pass through income" in the top income tier. Kevin Yoder, your bill gives corporations enormous, permanent tax breaks, but does not require one job to be created in return. The Kansas tax cuts had no job creation requirements either. Look how that worked out. Ron Estes, you were State Treasurer during the Brownback years and never said "boo" about the tax-cut-caused budget trouble. Surely though, now a Congressman, you must realize that the financially unsustainable plan you support adds $1.5 trillion to the national debt, placing huge financial burdens in our future. Roger Marshall, yes, your plan lowers individual income tax rates for most earners. Kansas did that too. But remember the offsets-personal exemptions, college tuition breaks, and medical and other deductions gone. Netted out, millions of Americans will actually get a tax increase. Any remaining middle-class tax cut amounts to window dressing. Can't you see? Your plan is skewed to benefit the wealthiest, as was the Kansas plan. Jerry Moran, you managed some plain, honest talk with Kansans on health care earlier this year. Why not do that on taxes too? We've been schooled, and can handle a real discussion. Pat Roberts, many say you've become out of touch with Kansas. Support for this tax plan certainly proves that true. The stance of the Kansas delegation highlights a brokenness in national politics. In front of their noses lies a crystal-clear example of a "trickle-down economics" disaster, but to a person the delegation appears unable to understand and engage the very thing that roiled their home state. Instead they read from Sam Brownback's old script and fall into soulless formation with party, apparently intent on dragging Kansas (and the nation) through another tax fiasco. Our Kansas delegation's behavior is perhaps predictable, but that doesn't make it any less depressing or unforgivable.